Healthy soil is alive – a principle that applies to both soils that are natural and those that are cultivated. A large part of what happens underground, however, remains hidden to researchers. Greater awareness of the phenomena involved would be useful in order to better understand the interrelationships in this ecosystem. What cannot be seen might perhaps be heard: with this in mind, researchers from ETH Zurich and the French National Institute for Agricultural Research (INRA) have been using piezoelectric sensors to investigate various soils for acoustic emissions. The result: when roots grow or earthworms burrow tunnels, they make noises that can plainly be traced back to root growth and worm activity. This has been demonstrated by a study conducted by Marine Lacoste from INRA, Siul Ruiz and ETH-professor Dani Or from the Institute of Biogeochemistry and Pollutant Dynamics at ETH Zurich. Listening to soil opens a new window for science, says Or: "We can learn when roots grow, for example. Until now, we didn't know whether it happens during the day, at night, or in wet or dry soil conditions. The new method allows us to find this out on site relatively easily – and without digging." The researchers have shown for the first time that biological activity in the soil can be measured using acoustic sensors. Piezoelectric sensors registered the acoustic emissions, which take the form of elastic waves at a frequency of 1-100 kilohertz. Sound waves of this nature occur, for example, when small grains move or rub against each other – or when tiny cracks form in the soil. Humans cannot hear them. After seven days (earthworm) and nineteen days (roots), the researchers correlated the observed root growth and burrowed tunnels with the recorded noises – they were highly consistent. Control measurements from cells containing only soil confirmed that the sounds originated from roots and earthworm activity. 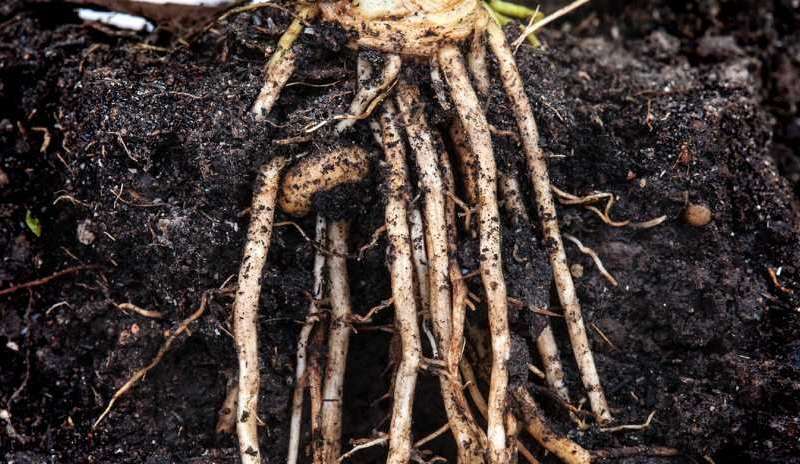 When do roots grow – and how many? Dani Or has already successfully investigated terrain for early signs of landslides. The work taught him to distinguish and interpret a range of acoustic emissions. He says: "The noises in the soil are of a very low magnitude, but the fact that they exhibit specific signatures means they can be attributed to specific sources. Worms, for instance, move much faster than roots, while their acoustic emissions are much more irregular." 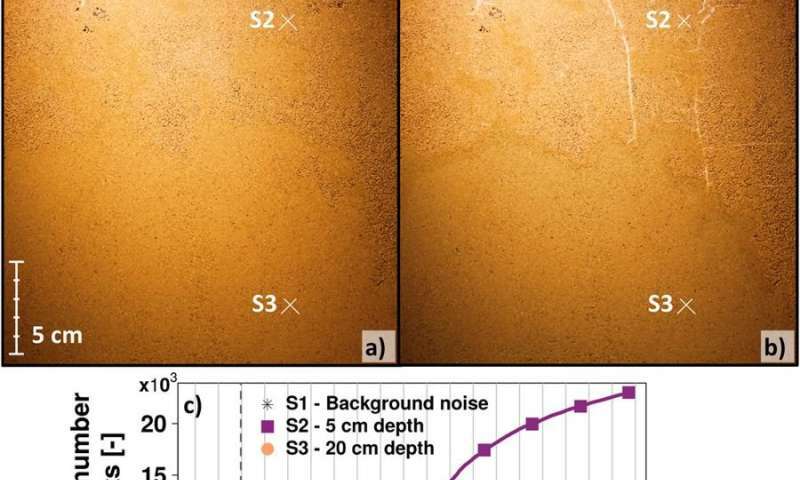 The study has allowed the researchers to demonstrate that soil biological activity can be measured acoustically – under laboratory conditions, at least. The next step involves looking at the situations that suit the method and how it plays out in the field. A preliminary test has already proved successful: the researchers let plants grow in an soil column – which allowed them to measure root growth acoustically. Or can well see his method being used by farmers in the future alongside other means of soil analysis. We need Metals to dig through Soil, while Plant do not need any to grow their roots way down. Always, Animals & Plants are way above us. Some Plants capture & Eat Insects, while we cannot photosynthesize like them. Would a stethoscope be useful for hearing such noises? Somehow, I think I would feel foolish to be found listening to roots growing and worms munching. The worms have a nice system of providing "castings" to replenish the soil after they have been munching on detritus and whatever else is in the soil. They are useful little buggers. Strangely, AFAIK we share some DNA with them. But then, humans share at least some DNA with all, or most, Life Forms. Now we can confirm this farmer's myth to be actually true by placing Piezoelectric sensors by their roots as the harvesters up root them. A sort of jungle carrot telegraph!